Background: Fluoroquinolones have been the centre of considerable scientific and clinical interest due to their broad spectrum pharmacological activities. Pefloxacin is an analogue of norfloxacin, which is a 3rd generation of fluoroquinolone antibiotic similar to ciprofloxacin. Pefloxacin is used to treat a variety of bacterial infections like respiratory tract, ear, nose and throat (ENT) infections, skin infections, and urinary tract infections. 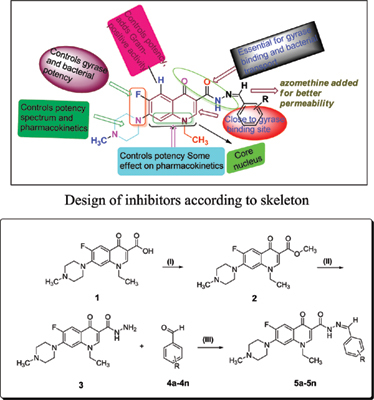 Hydrazone as a pharmacophore unit that attracts the medicinal chemists because of structure activity relationship (SAR) studies of fluoroquinolones especially the functionality at C-3 position. Consequently, recognition and development of potential ligands specifically for a protein target forms the primary goal in drug discovery process. Among the different theoretical approaches available, Gold and Glide are the molecular docking methods which find application protein ligand studies. In the current study, the DNA gyrase of Staphylococcus aureus has been used as the target protein to understand their possible interactions. Methods: The crystal structure of DNA gyrase (topoisomerase II) was downloaded from the Protein Data Bank (PDB ID: 2XCS, 3FOE) and molecular docking studies were performed using the docking programs like Gold 3.2 (Genetic Algorithm for Ligand Docking), Glide 5.0 (Grid Based Ligand Docking with Energetic). Melting points were uncorrected and determined in open capillary tubes in a melting point apparatus. TLC was performed on silica gel-G and spotting was done using iodine/ KMnO4 staining or UV-light. The following experimental procedures are representive of the general procedures used to synthesize all compounds. Results: The docking experiments of the title compounds with 2.1 Å crystal structure of DNA gyrase 2XCS, 3FOE using Gold 3.2 and Glide 5.0 is carried out to understand the binding interactions of the novel ligands with the protein, contributing for antibacterial activity. The compounds in general exhibited good binding interactions like H-bonding interaction and π-π interactions which stabilize the protein-ligand complexes and responsible for good fitness scores in both the protocols. Conclusion: In summary, a new series of novel pefloxacin hydrazones 5a-5n were studied for their interactions with Staphylococcus aureus DNA gyrase protein by Glide 5.0 and Gold 3.2 molecular docking protocols [PDB IDS: 2XCS, 3FOE]. Among the tested molecules, compound 5g exhibited a good Glide score value of – 7.73 and Glide energy −51.24 with emodel value of −66.16. The nice docking scores of 5g, 5a, 8h, 5m and 5b revealed that these compounds are well accommodated on the active site residues of DNA gyrase enzyme. From the docking study, we have explored the probable binding mode and the binding pattern of compounds 5f, 5l, 5h, 5d, and 5n showed that they strongly interact with in the active site of Staphylococcus aureus of DNA gyrase enzyme. From screening results it is found that compounds having aromatic ring substituted with electron releasing groups are showing potent docking scores and exhibited better fitness than reference compounds CPF and CA4. An efficient combination of molecular modeling and biological activity provided an insight into QSAR guide lines that could aid in further development and optimization of the pefloxacin derivatives. Pefloxacin hydrazones, molecular docking, Schrödinger software, DNA gyrase, fluoroquinolones, protein.